Commentators, former England stars and cricket-loving celebrities are to take part in a special match to mark Test Match Special's 60th birthday. Players-turned-commentators Jonathan Agnew, Geoffrey Boycott, Michael Vaughan and Phil Tufnell are among those taking part in the event on August 24th, which will take place at Sports Park Weetwood, part of the University of Leeds. Celebrities taking to the crease will include Made In Chelsea’s Jamie Laing, athlete Yohan Blake, actress Nina Wadia, and Baroness Tanni Grey-Thompson, plus comedians Dom Joly and Andy Parsons. Attendance on the day will be via ticket ballot. 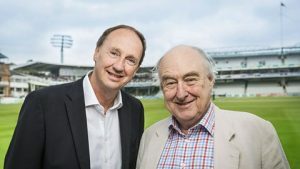 For those unable to attend, TMS 60 - Test Match Special Anniversary Match will be televised on the BBC Red Button as well as BBC iPlayer and BBC Radio 5 live Sports Extra.